Stage to Sell. Design to LIVE. Is your home feeling a bit tired? Paint colors and furniture outdated? Do you feel overwhelmed at where to start? Do you wish someone could come in and wave a magic wand and create a new space for you? Are you a builder looking for help with your show home? Do you need someone to choose the flooring, lighting, paint colors, and fixtures for your new project? Do you need someone to furnish it and pull the whole look together? At Fine Redesign we offer full interior design services for both builders and home owners looking to create a space that is current, on trend and affordable. At Fine Redesign, we believe interior design should represent your individual space, showcasing your unique style. It is your oasis, your sanctuary, the place where you exhale. 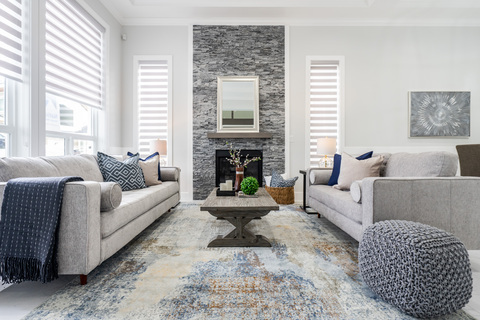 Whether you are looking to spruce up the old colors in your home with a dramatic touch or create the perfect neutrals, Fine Redesign is here to help. We can also shop for you to bring those colors together with the perfect decor items, bedding, window treatments and furnishings. We will work together to create a space that is not only stylish and functional, but also surrounds you with a feeling of comfort, meeting all of your design needs and making your home a place you love to reside. – Analyzing and researching your needs and requirements within your space. – Creating sketches and space plans, such as floor plans, elevations and sections for your perusal and for industry professionals to work from, including all construction documents. – Selecting mill work, lighting, fixtures like sinks, baths, faucets and other equipment such as appliances. – Choosing furnishings and custom work. – Prepare project budgets and schedules. – Coordinate with other industry professionals throughout the project. – Oversee the project to make sure your needs are being met throughout the process of creating your space. During our consultation we will discuss the complete scope of your project, your goals and your budget as well as your tastes, lifestyle and design options to ultimately create the perfect space for you and your family to enjoy. We will discuss what is and isn't working including paint colors, furniture arrangement and art placement. We will follow up the Initial Consultation with a meeting at our design office (or emailed if preferred) that includes a Vision Board of the ideas discussed and a formal Proposal regarding the Scope of Work and Design Fees associated with the project. It is presented for approval and if accepted, the project is initiated and we can create a solid design direction to achieve your beautiful new space. This applies to occupied homes only, builders & new builds should contact us for commercial rates. Contact us today to book your consultation. A fresh new world awaits!